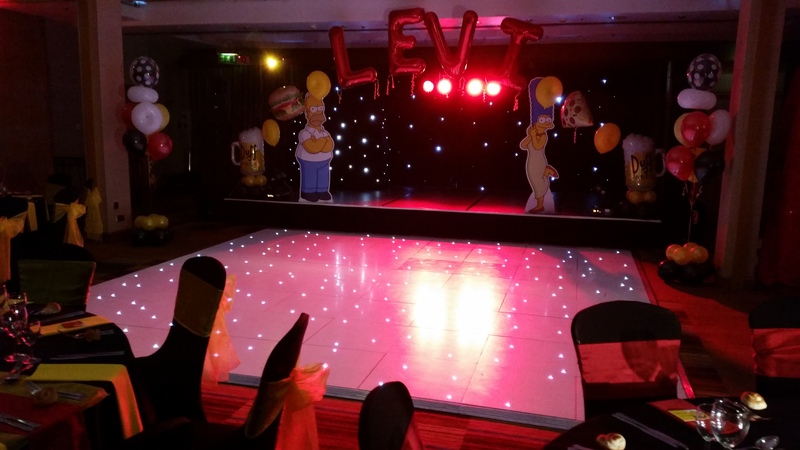 21st September ’14 – A pleasure to be providing a full disco & entertainment package for Levi Fraser’s Bar Mitzvah at the Victoria & Albert Marriott hotel in Manchester. This was the second Fraser Bar Mitzvah we’ve been involved in, having provided a similar package for their elder son Maverick last year, also at the V&A. 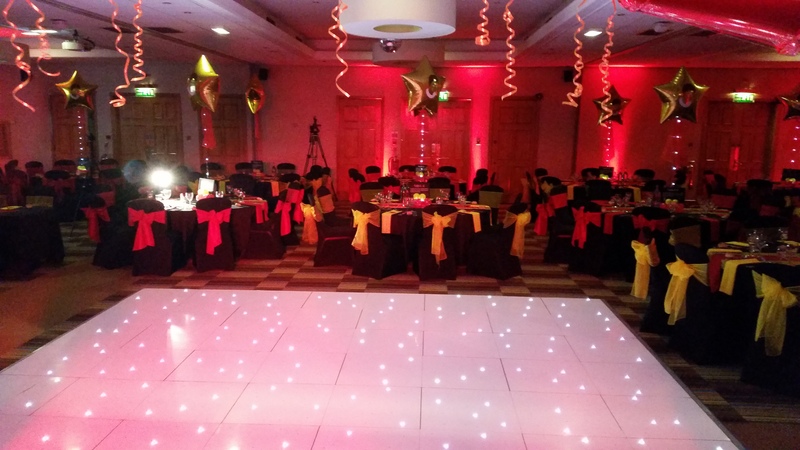 As well as booking DJ Andy B to act as host/DJ for the evening, we also supplied staging, backdrop, white LED dance floor & uplighters throughout the room. We can also provide competitive quotes for venue dressing/décor for these type of events. DJ Andy B got the party started with a 20 minute set of traditional Israeli music which was very well received, & of course, involved getting Levi & various family members up in the air on chairs! Once we’d got everyone settled down, it was time for dinner & the usual formalities. Throughout, we had live music from a beat box trio, stand up comedy from Sol Bernstein (billed himself as the oldest Jewish comedian still alive!) & a particular highlight for the boys (& the dads!) 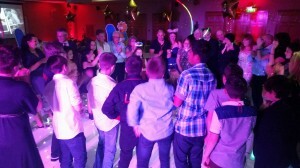 was the dance routines from the Chelsea Cheerleaders! After the speeches, it was time to get the party started with DJ Andy B playing a selection of popular chart & party classics to keep everyone dancing through till the midnight hour! 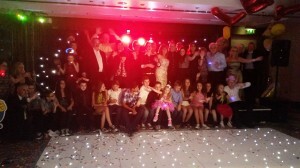 At the very end, we got everyone who was still standing up on the stage for final photos! All the best to Levi! Just wanted to say a huge thank you for all that you provided for our special celebration. 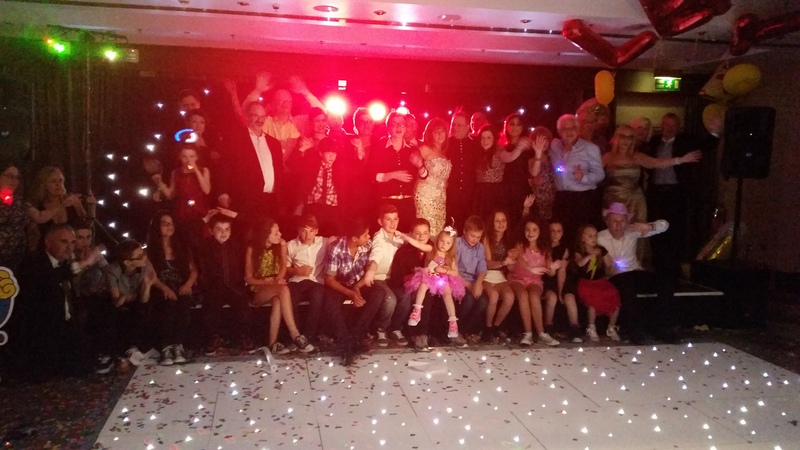 The stage, dance floor, up lighters , star cloth and yourself were all wonderful and helped to make the night an incredible success. 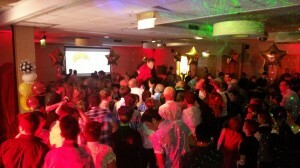 The dance floor was full all night and everyone had a fantastic time. 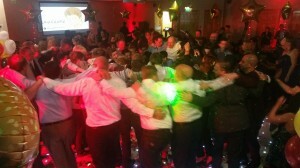 So, if you’re looking for an experienced DJ who can help make your Bar/Bat Mitzvah a success, email your enquiry to andy@andybevents.co.uk As well as the disco, we can also provide room theming/venue décor, staging, lighting various entertainment products such as photo booths & live music/entertainment.